The O’s celebrated reaching the FA Trophy Final after beating AFC Telford United at the weekend; but it was quickly back to league business on Tuesday evening with fellow Trophy Finalists AFC Fylde providing the opposition. A dress rehearsal of sorts, but the O’s went into the game leading the Vanarama National League on goal difference, while the Coasters rocked up at the Breyer Group Stadium in 5th spot and looking to close the gap on Orient’s lead. Justin Edinburgh’s side came out all guns blazing. Inside the opening three minutes the O’s had seen Macauley Bonne have a long range shot saved by Jay Lynch; Josh Koroma get inside the opposition box before being crowded out; then Captain McAnuff dragged a free kick too high. Orient were not showing nerves as they went about their business in this vital promotion clash. The O’s faithful had their nerves tested in the 4th minute though; Dean Brill coming out of his box to clear a ball that Alex Reid was looking to get onto to, but slicing his clearance straight to James Hardy whose shot luckily took a deflection and went off for a corner. The O’s had a lucky escape but two minutes later luck went against them as Josh Koroma went down in the box, but Mr Hulme the referee saw nothing wrong with Neill Byrne’s heavy challenge and waved play on. And the O’s soon had another attempt at Lynch’s goal, as Bonne turned and fired a shot that was knocked away for a corner. The recent spell of good winning form has come about as much by Orient’s tight defence and the O’s cleared a Fylde counter-attack, with Jamie Turley knocking a dangerous cross from Lewis Walters and then heading the resulting corner well clear. A goal seemed to be coming and it was to be the O’s that were to provide it. In the 15th minute Marvin Ekpiteta rose to get a header off from a corner, which took a slight deflection before creeping past Lynch. The O’s didn’t rest on their laurels as five minute later Bonne played in Koroma, but the Coasters were able to defend the attack, although they had to first clear a corner before they had snuffed out the danger. But in the 24th minute the O’s were awarded a penalty after James Brophy was felled in the box. Bonne duly despatched the penalty into the bottom left hand corner – the O’s were now on their way to the three points. The O’s kept pressing too, winning a corner after a Koroma and Bonne link-up. Walters found an unorthodox way of stopping another Bonne run: he clattered into him from behind, earning him a yellow card for his reckless challenge. Edinburgh had to make a substitution in the 37th minute as Turley took a knock whilst challenging for a ball. 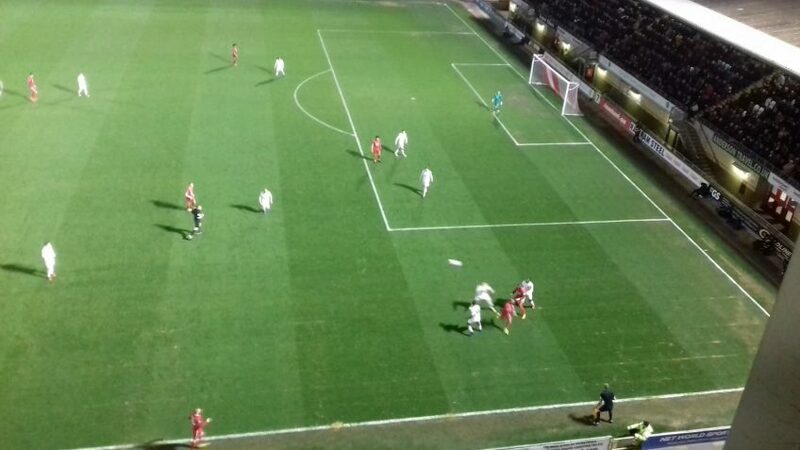 But it didn’t unsettle Orient’s defence too much as Marvin Ekpiteta blocked a Danny Rowe shot in the 39th minute. The Coaster talisman is a proven goal scorer at this level, but he was kept under close guard and so rarely had time or space to get any shots off. At half time AFC Fylde had not really tested the O’s and now had to find a way to get back on terms; from the first half evidence that looked very unlikely. Dave Challinor re-shuffled his pack by bringing on Ashley Hemmings and Nick Haughton at the start of the second half. Hemmings almost repaid his gaffer inside two second half minutes as he picked up a loose ball but could only fire it over the bar. The O’s then had a go themselves, with a McAnuff free kick just by the right corner flag being poked inches wide by Josh Coulson who lurked at the back post. At the hour mark the Coasters finally tested Brill, with Walters shooting from an acute angle that the O’s glovesman tipped away. Then a Craig Clay cross met a James Alabi header, but Lynch kept it out with a good diving save. Fylde went close soon afterwards with their own headed chance; the cross delivered by Hemmings being headed wide by Dan Bradley. The game had been entertaining, but tempers frayed in the 79th minute as players from both teams came together, and after all the pushing and shoving had blown itself out, the yellow card came out of Mr. Hulme’s pocket as Tunnicliffe and Bradley were booked for the Coasters; Clay the O’s player that had his name taken. Some of the tackles were full-bloodied, but it wasn’t a dirty game really, but the melee came out of Fylde’s frustrations at not being able to make any kind of impression on the O’s, with their best chance coming when a cross into Orient’ six-yard box was almost turned in by Ekpiteta; luckily Brill was on hand to cut the loose ball out. It would have been a shame to have conceded in that way, as the O’s kept Rowe quiet, with the Coasters top scorer only managing to fire long range efforts that didn’t force Brill into a single save. Rowe had one final dig in the 84th minute that sailed away from goal. Bradley then drilled a shot straight at Brill in the final minute. Fylde’s best chance of the game actually came so deep into stoppage time, that even if they had pulled one back from it, there would have been no time left to look for an equaliser. As it was Haughton’s snap shot was tipped away by Brill. It was an assured performance from the O’s, who now open a two point lead over Solihull Moors who could only pick up a point at Boreham Wood. The O’s will be looking to make it nine wins on the spin when they visit Barnet on Saturday. Leyton Orient: Dean Brill, Joe Widdowson, Josh Coulson, Jobi McAnuff (Capt), Craig Clay, Macauley Bonne, Dan Happe, James Brophy (Dale Gorman 90+4’), Josh Koroma (James Alabi 61’), Marvin Ekpiteta, Jamie Turley (James Dayton 37’). Scorers – Marvin Ekpiteta (15’), Macauley Bonne (24’p). AFC Fylde: Jay Lynch, Zaine Francis-Angol, Neill Byrne (Capt), Jordan Tunnicliffe, James Hardy (Dan Bradley 68’), Ryan Croasdale, Danny Rowe, Danny Philliskirk, Timi Odusina (Ashley Hemmings 46’), Lewis Walters, Alex Reid (Nick Haughton 46’).